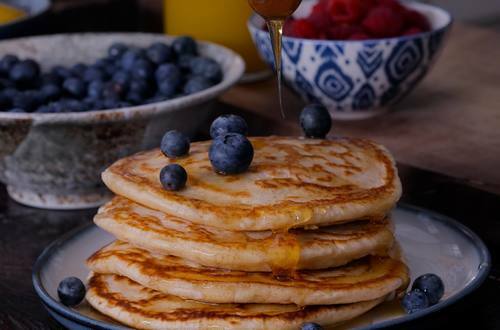 Using Hellmann's Real Mayonnaise in the mixture brings these American-style pancakes out so light and fluffy, you won’t know whether to eat them or use them as a pillow. 1 Sift the flour, baking powder and caster sugar together into a large bowl. 2 In a separate bowl or jug, lightly whisk together the milk, the egg and the mayonnaise. 3 Gently pour the milk, egg and mayonnaise preparation into the flour mixture, whisking as you go with a fork until you have a smooth batter. Lumps are absolutely not permitted! 4 Heat a non-stick frying pan over a medium heat and add a tablespoon of oil. When it’s hot, add a ladle of batter. 5 Wait until the top of the pancake begins to bubble, then run a heat-proof spatula or fish slice underneath the pancake to make sure it hasn’t stuck to the bottom of the pan, then turn over- or toss if you’re feeling lucky. 6 Cook on the reverse, and again for a moment on the first side so that the pancake is golden brown and has risen to around a one centimetre-thickness. 7 Repeat until all the batter is used up, or until all pancakes have stuck to the ceiling.